I think he just Trumped off the deep end. I’m sure you’ve heard by now. Earlier today Trump released a statement where he recommended we ban all Muslims from entering the U.S.
A ban on all Muslims entering the country. Not just refugees – that’s so three weeks ago. (And yes, scary to think Paris was only three weeks ago). Not just a tightening of the Visa waiver program, which many agree is worth looking at on a temporary basis. 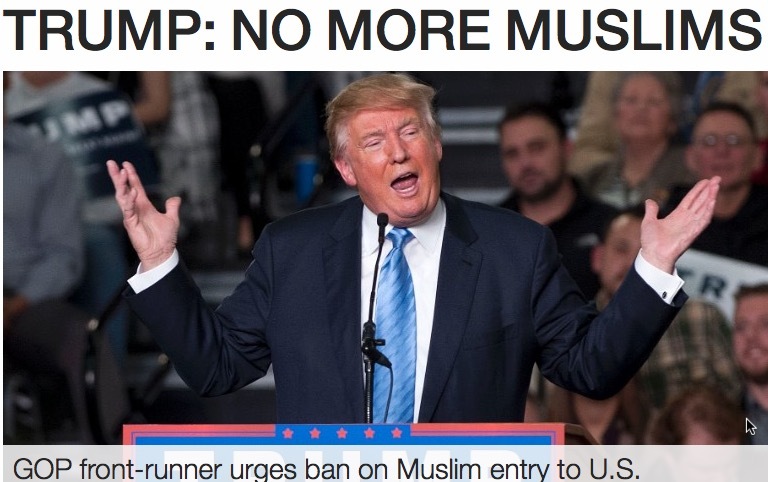 Muslim-Americans that happen to be overseas at the moment, for any legal reason? On business? On vacation? Studying abroad? Helping a sick relative? What about Muslim-American U.S. troops stationed abroad, currently protecting us around the world? In typical fashion, he does not specify. What about our sports heroes that Obama referred to last night, of which Trump, today on Twitter, can’t seem to think of even a single one…. despite the photos of him with Muhammad Ali, Karim Abdul-Jabbar, Shaquiile O’Neal, etc? Like the protesters in his audience of late, he alone will pick and choose who stays and who goes. Never mind if this is an American or legal thing to do — that is irrelevant. Can you imagine buying an airline ticket, in or out of the U.S., and being asked to prove your religion before you click “purchase?” How does that work? What if you like Middle-Eastern fashions, but are an atheist? What if you were born in the Middle-East and “look Middle-Eastern” and are an orthodox Christian? (Maybe there’s a tattoo you could wear to identify yourself to the authorities). What if you are a Muslim international airline pilot flying an A-380 from Kuala Lumpur to California? Should we stop you from getting off the plane at LAX and prevent you from going to the Daily Grill in the Tom Bradley terminal before your next flight, in case you might try to slip out the side door and into our Homeland? But Trump doesn’t have to answer any of that. Because Trump doesn’t stand for policies, and his followers don’t care. Policies? You mean those annoying things that politicians talk about where we actually think through ideas about what we might do, and how it would work, and write down stuff to debate, and ultimately disagree or agree on, as a country? You get the point. He has proven that for his crowd, reality is irrelevant. Trump has mastered the media. He understands that if each week, he just keeps turning up the ugly rhetoric dial, the 24×7 cable / social media news cycle stays focused on his latest offense, and getting everyone’s reaction, and before they can even finish analyzing the latest spin, half-truths and outright lies, he’s on to the next whopper. It worked all summer and has carried him through today. Every time he starts to fade from the news, he comes out with another one, to force his name back into the media cycle. It happened today. Two polls came out, and one of the two suddenly showed Ted Cruz taking the lead in Iowa. And then his bizarre, rather panicked statement came out, and now that’s all the media can talk about. The “Cruz news in Iowa” gets buried. It doesn’t mater if it’s a good idea. It forces everyone onto his battlefield, arguing about the subject within a frame of context that he has dictated. Never mind the facts. The national media, the political establishment on both sides of the aisle, the talking heads, bloggers, pundits, everyone…. at each turn for the worst, we fall into his trap, then wonder if he has finally gone too far, and finally imploded. And then his polls go up. The other day after San Bernardino, he boasted about the fact that every time something horrible happens, his “numbers” go up. He could hardly contain his pleasure that more blood was spilled. He’s feeding off the fact that the more bad stuff happens, the more of “us” die, the better it is for his brand. And he’s telling you to be impressed about how smart he is, because he’s honest about that. That is Fascism staring you straight in the face and daring you to make things worse, because it only becomes stronger. Like ISIS. Trump has more modern screen-image expertise than any major political figure besides Ronald Reagan (an actual WWII-era movie star and former corporate media spokesperson). This makes him effective and highly dangerous. He understands ratings, polls, and the need to own the momentum from week to week. His obsession with the polls is understandable because for him, they are exactly like TV ratings. If you have 30% of 20% of the country (see Nate Silver / 538), that’s 6% of the country – that’s pretty good, this early out, and you are leading the pack of other shows in your time slot. If the numbers stay up — keep going. Repeat that formula next week. Start to go down? We need some fresh shock, some new scandal to stay on top. He totally gets it. If you actually take the time to watch one of these rallies (try You Tube), especially in the last few weeks, it will give you chills. The tension in the room is palpable. The audience is hanging on his every word, the blood lust audible in their mob chants and cheers. This is Fascism in America. But remind yourself, it’s also Jerry Springer. You are watching a faded reality TV star with enough money to not care, manipulate the fears of America and the TV news cycle and his opponents as best as he can, and he will say and do whatever it takes to stay on top of the ratings. Even if it only means he sells a lot of books later. And that formula works for a while, but has to flame out. Call entire swaths of the audience rapists and murderers? We can afford to lose a few viewers this season. Suggest we monitor and/or shut down an entire subset of our population? That should get some play. Rough up protesters? Why not. Reinstate state-sponsored torture and suggest that even if it’s not effective, “they” deserve it? Let’s run with it this week. Physically mock the disabled on stage, like a playground bully? Oh I didn’t really mean that — you people are too politically correct. Suggest we consider killing innocent families, real live women and children, because they might be related to someone who might have been radicalized and turned to terrorism? After San Bernardino, why not? That will buy us 72 hours of news. Block an entire religion from traveling in and out of America? Yes – we have to assume the numbers only go up this week. He has painted himself into a corner. There’s not much left, before we get to trains helping people to camps. And that’s before a single vote has been cast. He is self-funding, has nothing to lose, and as he has plainly said: “I don’t care.” He’ll just go back to being a rich jerk building golf courses. That’s what his audience loves about him. He has no agenda but his own, and answers to no one but his own ego. It’s fun for a while. But eventually we all have to take out the trash. Just remind yourself that you are being entertained. Previous Previous post: Here we go again. Too close to home. Next Next post: Why I am Mourning in America.